The overnight shift at Brooklyn Center PD was surprised early Wednesday when 5 brand new puppies were dropped off. 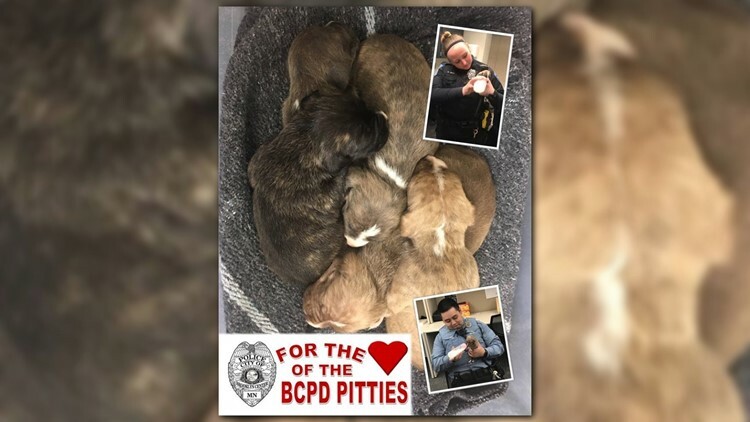 A post on the department's Facebook page details how Brooklyn Center Police officers showed their nurturing side when an unknown woman left five two-week-old terrier puppies in a dirty cooler. BROOKLYN CENTER, Minn. — Ask any sworn police officer and they'll likely tell you every shift brings the unexpected. It certainly was the case in Brooklyn Center early Sunday morning, when on-duty cops found themselves playing nurse maid for a litter of brand new pups. A post on the department's Facebook page details how an unknown woman left five two-week-old terrier puppies in the PD lobby in a dirty cooler lined only with a blanket. Sergeant Peterson and his officers found a clean container and another blanket to bundle the pups up until they could be transported to the Animal Human Society. It quickly became obvious that the little terriers needed more than warmth. "The pups were clearly hungry and had not eaten in some time, so our night shift took turns feeding them in-between calls," explained the Facebook post. "We're glad that the woman had enough sense to leave the pups with us as a last resort. We hope that their mom is okay and will make sure that the little sweethearts get into the right hands." The pictures shared by the department clearly show police officers have a nurturing side, and didn't mind the puppy-sitting gig a bit. Animal Humane Society spokesperson Mary Tan says the tiny dogs are split between two foster families and are all doing well. They will be back in for shots in two weeks time, and available for adoption three weeks after that.